Last week I was in South Carolina visiting family. The weather was sunny and hot, close to 90 degrees. I’ve been back in St. Louis for a few days now. The weather here is sunny and hot, close to 90 degrees. I know the calendar says it’s autumn, and the internet is blossoming with pumpkin and apple recipes, but the temperature feels like summer to me! 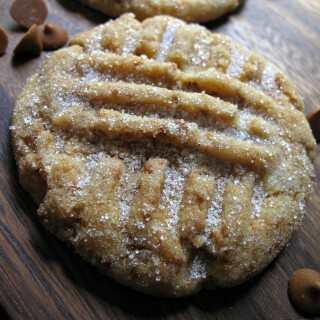 Before leaping into the flavors of fall, this summer-like weather calls for a cookie with cooling powers. 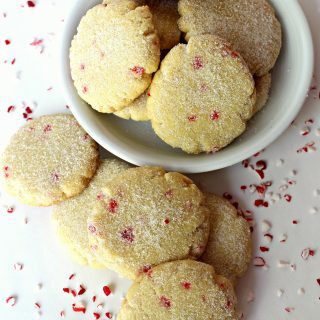 Lemon Peppermint Cooler Cookies provide a cooling rush of mint and citrus in each crunchy bite. I am as tired as everyone else of the continuing hot weather. The only thing that stops me from complaining is checking the weather in Kuwait, where my adopted soldier is deployed. The average September temperature in Kuwait City has been 104, but has been as high as 118! It’s obviously going to be a while before my military care packages can include chocolate! Even hard candy can melt in that kind of heat! Our military work in extreme conditions. That is why, while others may be thinking about warming recipes, I am thinking about a cooling recipe. 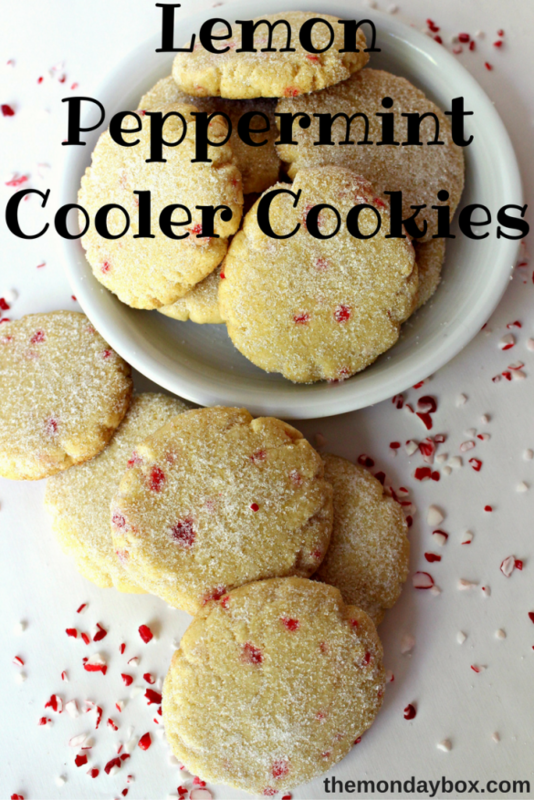 Lemon Peppermint Cooler Cookies are a twist on traditional Lemon Coolers. Peppermint flavoring and crunchy bits of peppermint candy boost the delicious cooling effect, like a bite of air conditioning! The cookies can be coated in powdered sugar or granulated sugar (which travels better). 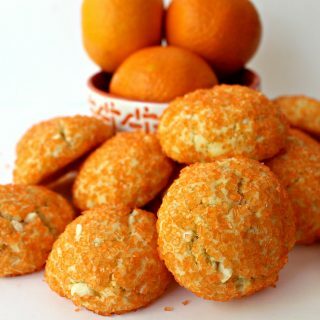 This recipe is equally delicious using butter or, for a desert safe recipe, using vegetable shortening. Though lemon zest is traditionally used to provide citrus flavor, lemon flavoring (a desert safe option) works just as well. I used a variety of sources while developing this recipe. I adapted flavoring and ingredients from Sparkling Lemon Cookies, a desert safe, cakey cookie, but tweaked things a bit to create crunch. An extra lemon tang comes from an easy idea used by somethingedible.com. Melted white chocolate chips ( 365 Everyday Value® White Chocolate Baking Chips Mini), mixed with a tiny bit of unsweetened lemonade powder, is spread thinly on parchment, chilled to set, and then finely chopped. 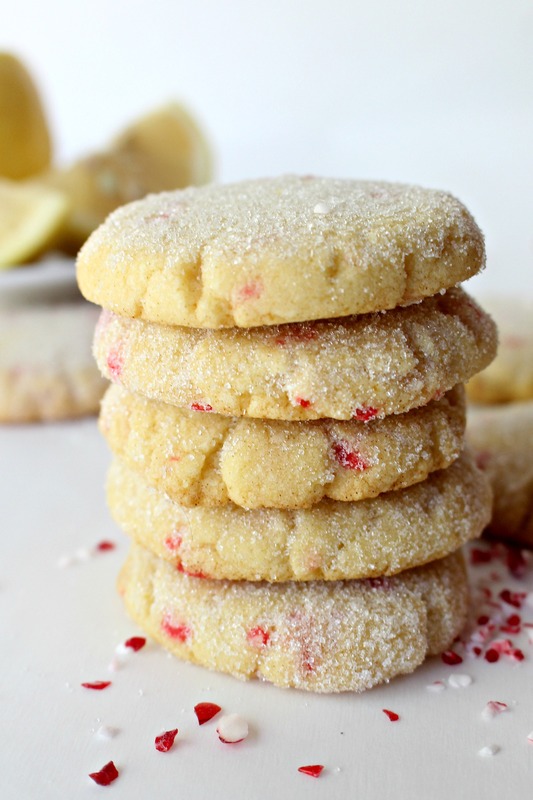 The tiny pieces of lemony goodness accent every bite of cookie. A batch of Lemon Peppermint Cooler Cookies is on its way to Kuwait in a “Keep Cool” care package. Another batch is being enjoyed with iced tea here in the sultry Autumn St. Louis heat. Until the weather catches up with the calendar, I suggest you enjoy a sweet chill with your own batch of Lemon Peppermint Cooler Cookies . In a small bowl, microwave white chocolate chips and lemon powder for 1 minute at 50% power. Stir until combined and completely melted. Using a rubber spatula, spread the melted chocolate (thinly, about 1/8”) onto one of the parchment paper lined baking sheets. Place the baking sheet in the freezer until solid, about 10 minutes. 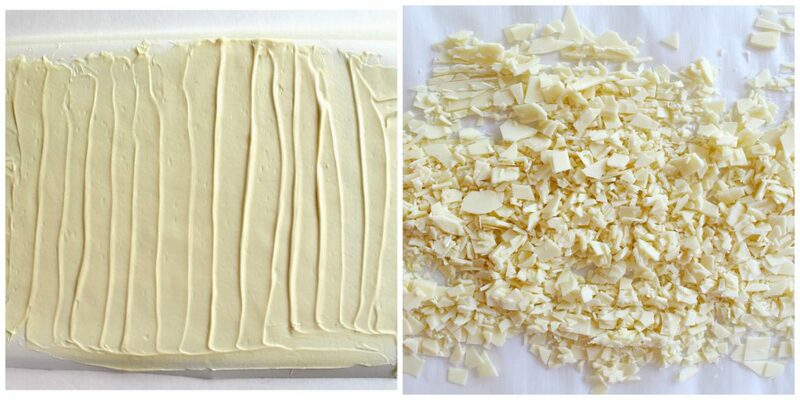 Remove the white chocolate from the freezer and chop finely into pieces about the size of a grain of rice. Set aside. In a medium bowl whisk together flour, baking powder, and salt. In the bowl of an electric mixer, cream together butter (or vegetable shortening) and sugar until combined, about 2-3 minutes. Mix in the egg, peppermint extract, vanilla extract, lemon juice (or water), and lemon zest (or lemon extract). Reduce speed of mixer and slowly add dry ingredients until just combined. Overmixing will produce a less tender cookie. Fold in chopped white chocolate and crushed peppermint candy. Use a small scoop (1 tablespoon) to divide dough. Roll each scoop into a ball and place 1”-2” apart on prepared cookie sheet. Use your palm to gently press each ball into a disc about ½” thick. Bake for 10-12 minutes. Tops of cookies should not darken. Bottom edge of cookies should have just begun to turn golden brown. Cool on baking sheet for a 5 minutes or until cool enough to handle. Press the tops of the cookies into granulated or powdered sugar, then transfer to wire racks to cool completely. 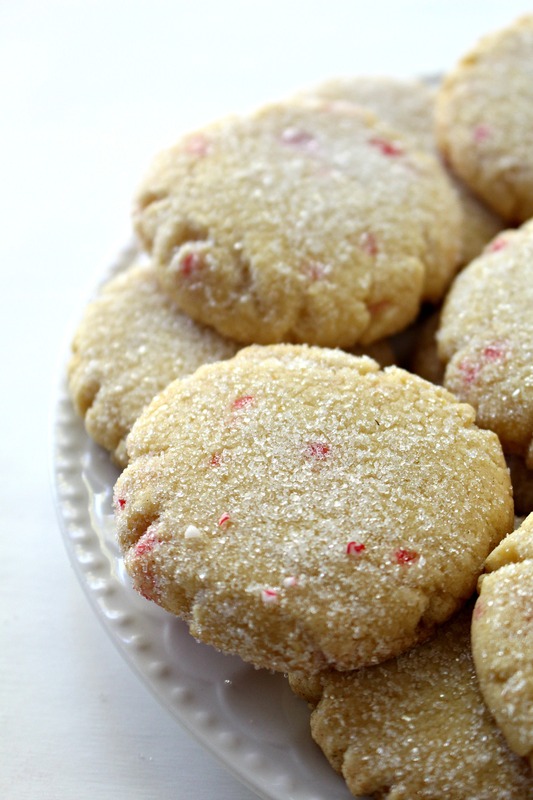 These cookies should be crunchy and will get more flavorful and crunchier over time. 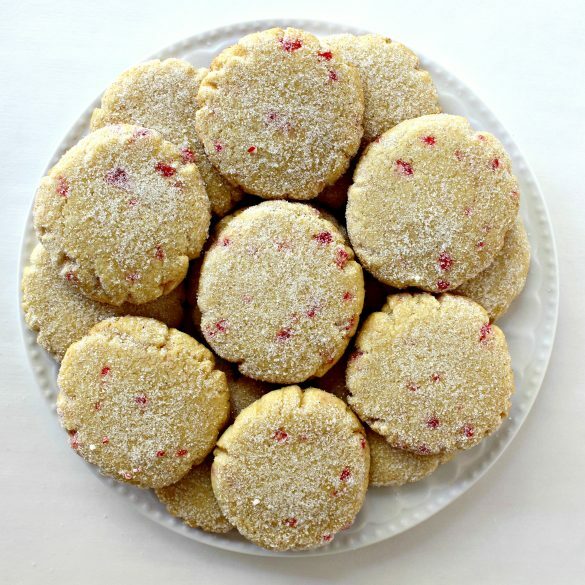 Lemon Peppermint Cooler cookies remain fresh for least 10 days, if stored at room temperature in an airtight container. ***NOTES FOR DESERT-SAFE BAKING: These cookies are equally delicious when baked using the indicated (**) desert-safe ingredients. Use Crisco instead of butter. Use lemon extract instead of lemon zest. Use water instead of lemon juice. 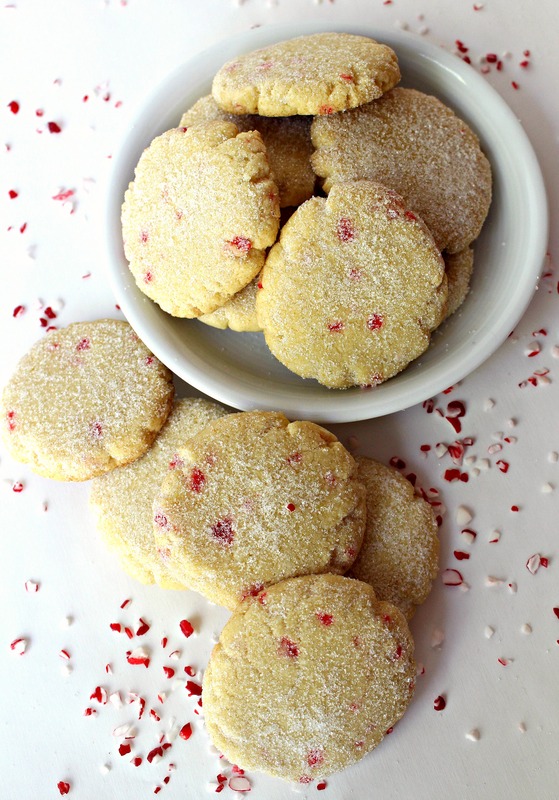 Granulated sugar travels better than powdered sugar when decorating these cookies. Double wrap pairs of cookies, with bottoms together, in plastic wrap. Place in airtight containers or in columns in freezer weight ziplock bags. Alternatively, unwrapped cookies can be packed in an airtight storage container with wax paper between layers and crinkled wax paper on top to stop any movement inside the container during shipping. These cookies are also great travelers in warm weather care packages! It still absolutely feels like summer by us too! I want to start really enjoying fall foods but with the heat it’s so weird! haha Anyway, these cookies look and sound fantastic!! Thanks, Ashley! The cool weather will be here soon enough. Perhaps we should just savor the final wave of summer for the year! 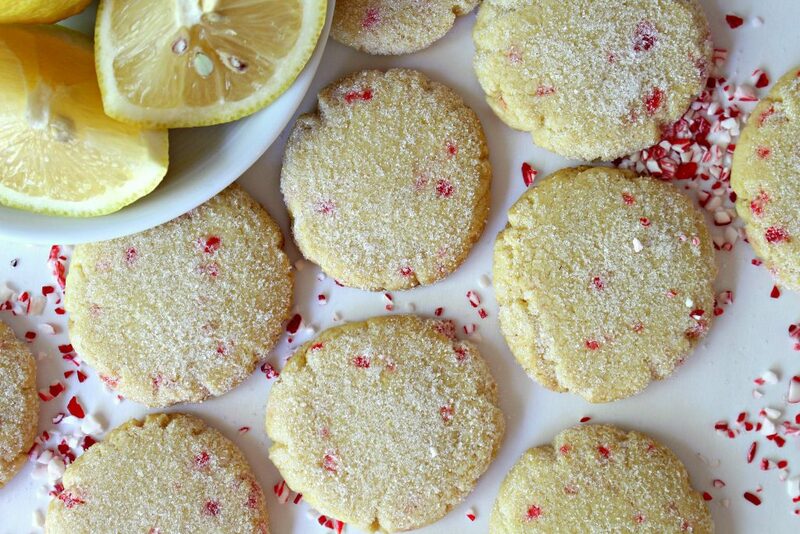 I don’t think I ever had lemon with peppermint in a cookie or dessert before! I’m curious about the flavors together and love white chocolate with both. It’s been super hot here up North too – but today the temps finally dropped and it feels more like fall. 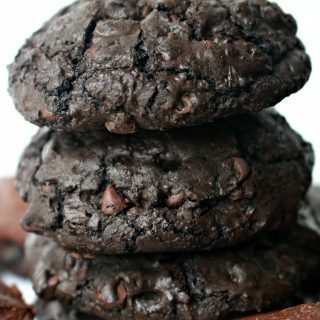 Regardless I’d love a big stack of these cookies!